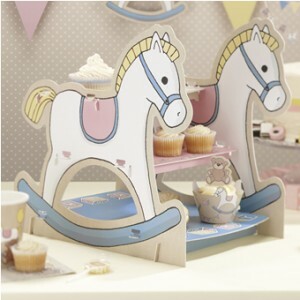 A charming cake stand or sandwich tray with rocking horse sides and 3 tiers to hold your party goodies. It is easy to assemble and will look impressive on any party table! A perfect table centrepiece to complement the Rock-a-bye Baby range. A perfect table centrepiece to complement the Rock-a-bye Baby range. The stand comes flat packed and measures 9.8 x 13.5 x 14.2 cm when assembled.